Emerging diseases don’t arise from nothing; they are established diseases that move away from their previous niche. Usually when a pathogen tries to move out of its comfort zone, it drives down a dead end; it might infect a few individuals, but it doesn’t spread effectively, and it fizzles out. Of course, we don’t usually hear about the fizzles; we hear about the successes (HIV) and the partial successes (SARS, avian influenza, Sin Nombre virus, and many more). Even so, many people don’t seem to know much about one of the most spectacularly successful emerging diseases of the 20th century. In 1978, dogs around the world suddenly began to die, developing a bloody diarrhea and rapidly (often overnight) progressing to fatal dehydration. This turned out to be due to canine parvovirus 2 (CPV2); dogs were already known to have a parvovirus (CPV1) but this one was new, and lethal. It exploded around the world within a few months, infecting millions and killing thousands of dogs. The actual mutations in CPV2 that allowed it to spread into dogs have been pinpointed — there are changes that allow the virus to infect canine cells, which FPV can’t do. Not surprisingly, though, CPV2 has continued to mutate rapidly since 1978. 2 It’s moved into a new ecosystem, and it’s adapting to that ecosystem in a hurry. New variants of CPV2 are now showing the ability to infect cats (again? ); something to watch for. Viruses that successfully switch hosts are rare, but potentially catastrophic, events. The lessons of CPV might help us understand how, say, influenza viruses might shift from chickens to humans (and this hasn’t gone unnoticed;3 I’m not the first to make the connection by any means). 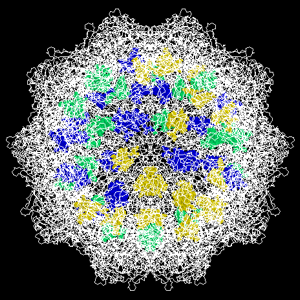 CPV is a unique resource, because we have examples of so many of the steps in the evolution of a virus that’s adapting to a new host. Shackelton LA, Parrish CR, Truyen U, Holmes EC (2005) High rate of viral evolution associated with the emergence of carnivore parvovirus. Proc Natl Acad Sci U S A 102:379-384.